A photo oppportunity came my way today. I did not have to get up early to catch the sunrise or wait till sunset. I am glad because today is windy and cold and not conducive to be outside for long. The hot days of summer in Bright seem to have passed. My iPad can be temperamental. When I click the button it sometimes seizes up. I took a number of shots, but this is what turned out. The tractor and trailer passed by my house. 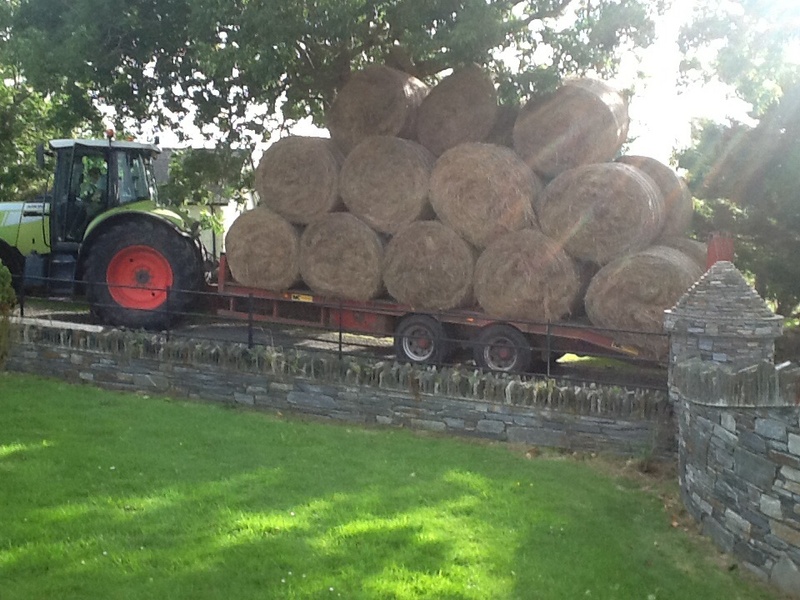 My neighbour was gathering in this harvest of hay. It will be used to feed his cattle and horses through the winter months. You can see the rays of light silhouetted through the trees and giving off rainbow colours. I am reminded of this scripture. This was given to Noah after the earth was flooded. God promises mankind that the earth will never again be flooded completely and he put the rainbow in the sky to remind us of his covenant. Farmers need faith in God to do their work. They plant the seed in the spring time. They trust God that there will be dry days to get out in the fields to get the ground ready. Ground is ploughed up, harrowed and then seeds sown. The seeds grow up as the weather improves and the ground get warmer. God causes the seed to grow. As the crop ripens there will always be a warm day for the farmer to go out into the field with his heavy duty tractor and equipment to bring in the harvest. God promises there will be time to bring in the harvest. I was studying about the god of Baal. He was the god of thunder that people of old worshiped and made sacrifices of their children to in order to get good weather for harvest. God our Father is the only true God, revealed through Jesus. He is In control of thunder, lightening, hail, rain, wind and sunshine. He promised he will give good weather for the harvest. I’ve very much enjoyed reading your blog. Do you remember Nate & Evelyn who you met in Newcastle West, Co. Limerick in 2011? Now that you’ve moved we would love to have your current address so that we can send stay in touch. Can you email that to me?